Faith Hill (born Audrey Faith Perry on 21 Sept 1967 in Ridgeland, Mississippi), is an American country music singer. Faith married country music singer Tim McGraw. Faith's singles include: The Kiss, Breathe, and Mississippi Girl. Faith Hill starred in the movie The Stepford Wives and in 1996 make a guest appearance on the TV series Touched By An Angel. Faith Hill signed with CoverGirl in 1999. "I'm extremely excited to be a part of the Cover Girl family," commented Faith Hill. "Cover Girl conveys a positive message, which reminds us that being beautiful on the inside is just as important as being beautiful on the outside." Faith also endorsed Pepsi. She signed with Coty to created her signature fragrance, Faith Hill Parfums, launching in October 2009, with the tagline The Beauty of Being a Woman. "Fragrances not only stimulate our sense of smell, but they can stimulate our memory, our emotions and can provide us with a feeling of confidence and beauty. 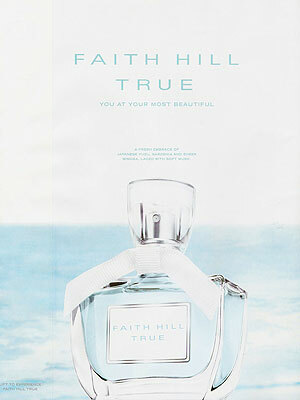 I hope that we've created a scent that can do that, not to mention one that looks beautiful on your vanity," Hill said.